Pre-cutting the fabrics is a mandatory requirement prior to taking this course. Please begin preparing for class at least 2-WEEKS prior to the class to make sure that you are able to get familiar with your pattern and complete the pre-cutting beforehand. We always recommend reading through your entire pattern before beginning. Fabric Selection: There are several different color-way options on this pattern. One color-way uses Bali Pops, which will give a varied appearance throughout your table runner. The other option is choosing 8 fabrics to be repeated in every arc, which will provide a more uniform look to your table runner. Please refer to the yardage chart on the back of your pattern for the required fabric amounts. The third option, which is my recommendation, is to choose either a package of Timeless Treasures “Tonga Treats” 2 ½” strip pack or Island Batik “Strip Tease” 2 ½” strip pack. The pattern will use 2 strips of 8 colors and 2 additional strips for the corners, 18 strips in all, out of the 40 that come in one package. You can make 2 table runners from one package of strips and you only have to purchase additional fabric for the “Centers, Melons & Background” which is 1 2/3 yards per runner. Using the strips also eliminates a good portion of the pre-cutting since they are already cut!! Preparing your Foundation Papers & Templates: Please read and follow the instructions for “Foundation Papers and Templates” on page 1 of your pattern. Templates: These are cut out freezer paper and assist in cutting the Center Template and Melon Template for this pattern. If you would prefer not to cut templates out of freezer paper, Judy has designed, in conjunction with Creative Grids, a set of plastic templates specifically for her Wedding Ring Series quilts, bed runners and table runners. If interested in purchasing a set of templates, please contact me at compasspointquilts@gmail.com to make arrangements to have a set mailed to you. Cutting Instructions: Follow the Cutting instructions on page 2 of your pattern. Place fabrics into the bags specified in the cutting instructions. 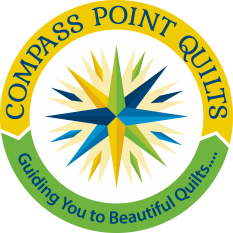 If you have questions, I can be reached at compasspointquilts@gmail.com.